Whether or not the Chicago Bears will beat the Green Bay Packers this Sunday is a question still answerable only by higher deities. But if those powers that be decide to unleash weather conditions of biblical proportions again, at the very least the Soldier Field folks can be confident that their in-stadium network will stand up to the challenge. Earlier this year, tornado weather hit Soldier Field and caused an unusual 2-hour delay during the Nov. 17 Bears-Ravens game. While the deluge was too dangerous for football, for Doug Lodder and Luca Serra, it was a big test to see if the stadium wireless network upgrades they’d recently helped install could stand up to a huge, unexpected traffic surge. “We thought we’d probably see some good [network] usage with the weather delay and tornados,” said Lodder, vice president of business development at Boingo Wireless, which recently concluded a big network upgrade at the home of the NFL’s Chicago Bears. Even though you can’t really plan or design for surges that might happen during extreme situations, Serra and Lodder and others running the Soldier Field network knew last year that an overall upgrade was needed. 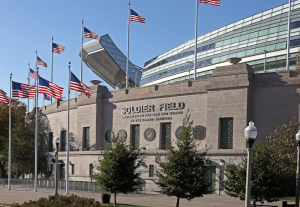 Home of one of the earliest (if not the first) big-stadium DAS and Wi-Fi networks, Soldier Field was showing 80 percent year-over-year traffic growth on the Wi-Fi network, Lodder said in a recent joint phone interview with Serra. 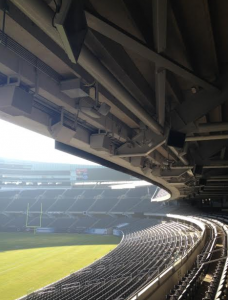 Along with DAS partner AT&T, SMG and Boingo spent last year adding more DAS capacity so that Solider Field now has 250 DAS antennas to go along an undisclosed number of new Wi-Fi APs. Though AT&T did some specific upgrades to its DAS presence at Soldier Field (including adding support for its new 4G LTE network), all the major wireless carriers are represented in the DAS via the neutral hosting of Boingo. Why did the firms decide Soldier Field needed an upgrade? While Lodder said its DAS, which first started operating in 2011, was “pretty cutting edge at the time,” during the past couple years, data usage at Soldier Field has skyrocketed. “With this large increase in use, we said ‘let’s address the issue’ and not let it get to a point where it’s a problem,” Serra said. Both Serra’s and Lodder’s teams were familiar with the need to balance performance and aesthetics at the venerable stadium perched on the edge of Lake Michigan. Since the network was put in after Soldier Field’s extensive renovation was finished in 2003, special attention needed to be paid to placements of Wi-Fi and DAS antennas. For Lodder, that sometimes means that the best placement isn’t always available. 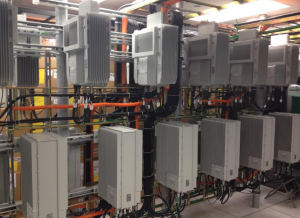 A bigger construction concern of late is where to put the extensive amount of back-end telco gear needed to support the DAS infrastructure and upgrades. 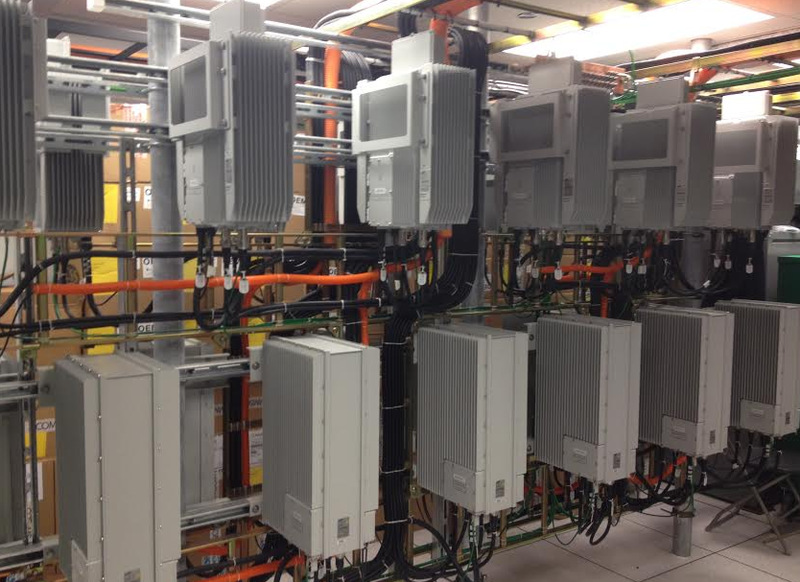 “Carrier base stations need several thousand square feet of space, and those need to be rooms with connectivity and power,” Lodder said. At Solider Field, Serra said some unfinished space north of the stadium proper was converted into a DAS equipment room, since there wasn’t enough available space in the main building. Lodder said for the recent upgrade, additional power upgrades were installed as well. 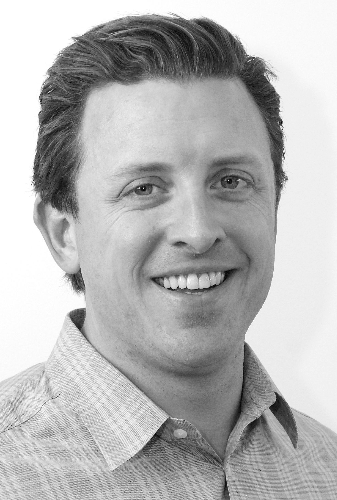 Still, even with all the challenges the Boingo, AT&T and SMG teams were able to go from design to finished construction of the recent upgrade in 45 days this past summer, in part thanks to some interesting work schedules. One other interesting twist to the Boingo Wi-Fi network at Soldier Field is its cost — the company charges a $1.99 per day fee for Wi-Fi use, or you can purchase a regular Boingo monthly plan for $7.95 which will also provide access at Soldier Field. 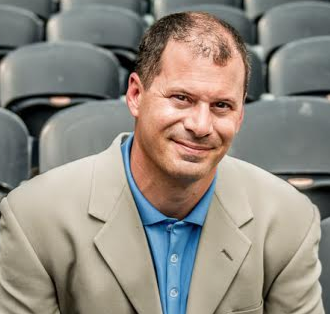 While many if not most professional teams are making Wi-Fi services free to paying ticketholders, Serra and Lodder said that the Bears aren’t. “The Bears are a tenant of the Park District, and no one [from the team] has ever said ‘we’re going to pay to turn it [Wi-Fi] on for free,’ ” Serra said. Lodder noted that in the end, someone somehow has to pay the cost of connectivity. 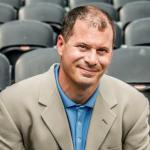 While the NFL itself is still somewhat vague on its league-wide plans for in-stadium Wi-Fi — other than saying that teams should provide it — Serra and Lodder are confident that Soldier Field will be at the top of the chart when it comes to network performance. 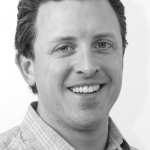 “If and when they [the NFL] roll out standards for network performance, we’re going to exceed them,” Lodder said.